It is still November, however the pre-Christmas madness has well and truly descended. I, as always, am avoiding the crowds and doing the bulk of my shopping online. (I swear, although it does not seem like it, this post will be loosely food and drink related). When I was trawling through THE online mecca of gifts – Etsy – (or, as The Brooding Architect calls it “ebay for crafty folk”) last night, I spotted the perfect Christmas gift for myself and had to self-gift. 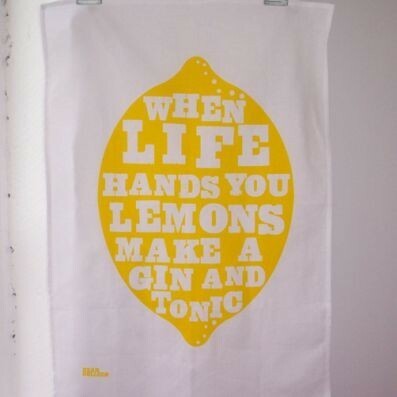 If you like what you see, the Gin & Tonic tea towel can be purchased from the UK based Etsy store, Dear Colleen. She also makes a pretty cool “dishes I’d rather be doing” tea towel, the perfect gift for Mr Darcy lovers. The Doctor: He must call Etsy that behind my back, to impress the wanky red bike gang.